To Cite: Moradi-Lakeh M, Namiranian N. Increasing Trend of Low Birth Weight in Rural Areas of Iran: a Warning, Iran J Pediatr. 2013 ; 23(1):123-124. Low birth weight (LBW) is usually defined as birth weight less than 2500 grams; it is an important risk for morbidity and mortality especially in infants and children under 5 years and even is a risk factor for morbidity in older age groups. Despite significant improving trend in most of health indicators in rural areas of Iran[2,3], there is a slow increase in LBW among newborns. Based on official data extracted form vital statistics of rural areas in Iran, LBW was 2.9% in 1994 with coverage of 83.9% in newborns; In 2004, LBW was 4.7% (coverage: 96.2%) and in 2009, it was 5.1% with a complete (100%) coverage of rural newborns (Fig 1). This increasing trend of LBW is statistically significant (P-value for trend: 0.0001). LBW is a reliable indicator in assessment and monitoring the maternal and child health program and finding a rational reason for this increasing trend is important. Other authors have reported increasing trends of LBW from other countries such as Turkey, Brazil, United States and United Kingdom[1,4-6]. 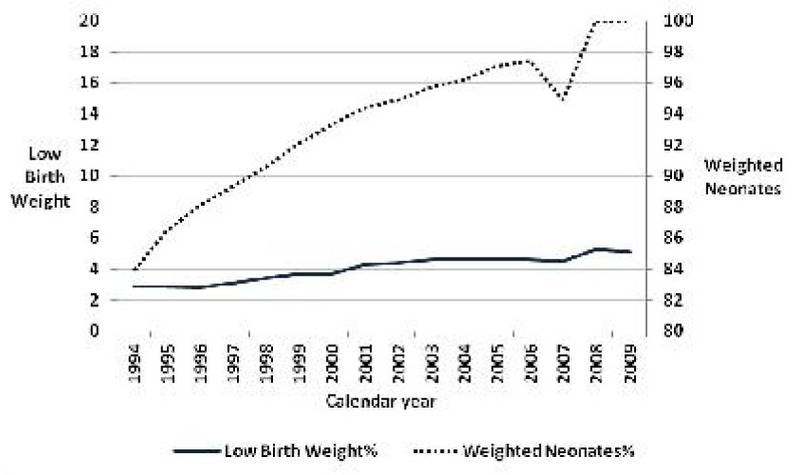 In the case of Iran, concurrent increase in the coverage of weighted neonates could be a statistical reason; since newly covered population has generally worse access to health services, larger proportion of LBW is expected. In such condition, the real number of LBWs has not increased and just more cases have been detected; it could be somehow true, but means that newly covered population has much more risk of LBW than previously covered and is a real concern for health equity. Other probable reason would be reduced incidence of abortion and intra-uterine fetal deaths by providing better prenatal care to high risk pregnant women[4,6]. The other prbable reason would be a real increase in the incidence of LBW due to different risk factors of LBW such as higher proportions of primiparous and smoker mothers, higher proportion of preterm babies and inappropriate prenatal care; unnecessary specialization of prenatal care i.e. selecting more-expensive and less-accessible services of obstetrician/ gynecologists instead of more-accessible and cheaper services of midwives and community health workers for prenatal care which is a real shift that has happened in Iran; this could lead to low-quality prenatal care. Detecting causes for this worrisome trend of LBWs needs further studies and is necessary for planning new preventive interventions. Standard prenatal care for all pregnant women and standard care for all LBW cases are of important rules.